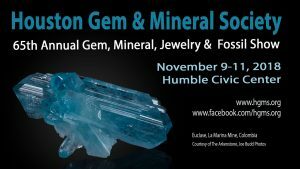 Houston Gem, Mineral, Jewelry, Fossil Show is Nov 9-11! Please join us for the 65th Annual Houston Gem, Mineral, Jewelry and Fossil Show, November 9 -11 at the Humble Civic Center! Our show features 45 dealers showing minerals, fossils, jewelry and gemstones, demos of lapidary skills, and many special exhibit cases. We have our School Daze program on Friday for elementary school kids, and a program Saturday for Boy Scouts. Bargain hunters should visit the Swap Area. There is something to thrill and amaze everyone. Convenient for Christmas shopping and as always parking is free. Tickets are $8.00. For more information visit www.hgms.org or www.facebook.com/hgms.org. Get your picture taken with a 7 foot tall “live” dinosaur, which will be roaming our halls! Free Expert fossil and mineral identification! Shop at dozens of vendors from across the US for unique and ancient items including fossils, minerals, gemstones, handmade jewelry and more from around the world. Watch our live demonstrations including geode cracking, silver smithing, fine detail painting of stone slabs, and much more! Get a gem at a Bargain at our popular Silent Auctions occurring throughout the show! Enter to win our Free Grand Door Prize! Tickets for the show are $8 for adults. Next PostNext New England Gem and Mineral Show! Save the Date!